Michael Hill's Emma and Roe jewellery collection: perfect for Mother's Day. Five jewellery pieces that fix the “what do I buy mum for Mother’s Day?” problem. When it comes to Mother’s Day gifts, my mum only ever has one request. That it ‘sparkles‘. She is obsessed with all things jewellery and will often gift herself with pieces that she says are ‘from my dad’. In reality that’s code for ‘I bought it for myself with Dad’s wallet’. And when you’re trying to buy for a woman who really does have everything, picking a present that she’ll treasure and remember forever is a tall order. But I’ll let you in on a secret I’ve discovered: it’s called Emma & Roe. They offer the next generation in fine jewellery and accessories. So if you’re finding yourself buying for a ‘hinter’ (otherwise known at the mum who drops not so subtle hints about what they want for Mother’s Day) then they’re the perfect go-to. If you want to give your mum a gift that still allows the element of choice, mini pendants are the way to go. They&apos;re incredibly versatile as you can wear them on a necklace, bracelet or both. They can be easily incorporated with other jewellery as well and layered in a variety of ways. A simple letter indicating your mum&apos;s name or adding her birthday colour gives the perfect personalised touch. Stackable bangles are one of my favourite trends because the options are limitless and they&apos;re back at the moment in a big way. I&apos;m all about mixing sterling silver with gold to make it look more custom and the Emma & Roe collection also includes different coloured crystals and cubic zirconias. You can mix lots of different elements and personal favourites of your mum&apos;s to make sure it&apos;s a stack she&apos;s reaching for again and again. If your mum loves her necklaces, why not consider putting together a personalised set for her? Emma & Roe offers a number of chain options in a variety of colours including sterling silver and yellow gold. You can add pendants to them to further accentuate your creation. I&apos;m a big fan of the coin pendants in rose gold with a mother of pearl centre because I&apos;ve never seen anything like it and it&apos;s truly unique. 4. 10ct Gold and Sterling Silver Charms. The best part about opting for charms as your Mother&apos;s Day gift is you can add to the bracelet year after year. You can even make a day of it and take your mum with you to select her new charm together. Cu-te! Once you&apos;ve filled up a bracelet, you just move onto the next. Emma & Roe also has a number of charms specially designed for Mother&apos;s Day with adorable little messages such as &apos;I love you to the moon and back&apos; engraved on them. You can even go one step further and have the message engraved yourself. 5. Flourish Collection New Releases. If your mum is a flower person, there&apos;s no going past a new release piece from Emma & Roe&apos;s Flourish Collection. Every single piece of jewellery is detailed with FLOWERS. It really does give a whole new meaning to getting a bunch of flowers for your mum this Mother&apos;s Day. 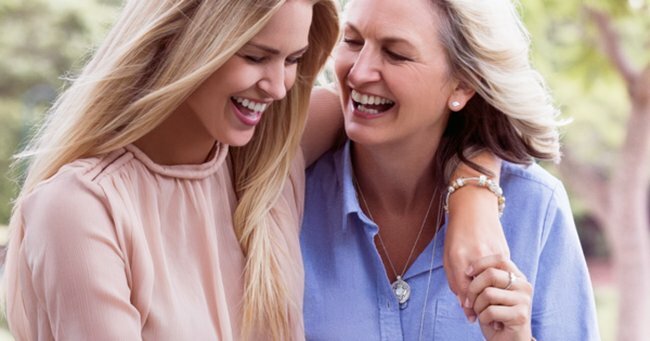 From bracelets, to pendants, charms, rings and earrings, you&apos;re sure to find something that screams &apos;Mum&apos;. My personal favourites are the white enamel, sterling silver and 10ct yellow gold daisy stud earrings with the matching charm. How are you spoiling mum this Mother&apos;s Day? This content was created with thanks to our brand partner Emma & Roe.